Wise Mind is to balance Doing Mind and Being Mind. Doing Mind is a goal-driven part of ourselves. Doing Mind is super effective at helping us set and achieve goals; it is a force that moves us towards objectives we want to accomplish. It allows up to be productive. Being Mind is a place of contemplation - nothing to do, nowhere to go. Being Mind allows us to notice beauty of the moment, basking in what we have, savoring the here and now. Wise Mind is balancing between these two states: focusing on achieving goals while letting go of attachment to the goals. My Doing Mind is very strong, so I have learned to use my it to my advantage. For example, it allowed me to do well in school. I’m also almost never late. I am an organized person and I’m an excellent employee. I’m very good at managing money, and I find that planning comes easy to me. I’m also very familiar with the downside of Doing Mind. It makes me anxious when I think that I’m not as productive as I think I should be. I become frantic and critical of myself. My mood dives down. My Being Mind often shows up in nature. I love backpacking. When I’m out in the wilderness, I tend to achieve a state of peaceful contentment that often eludes during work days. 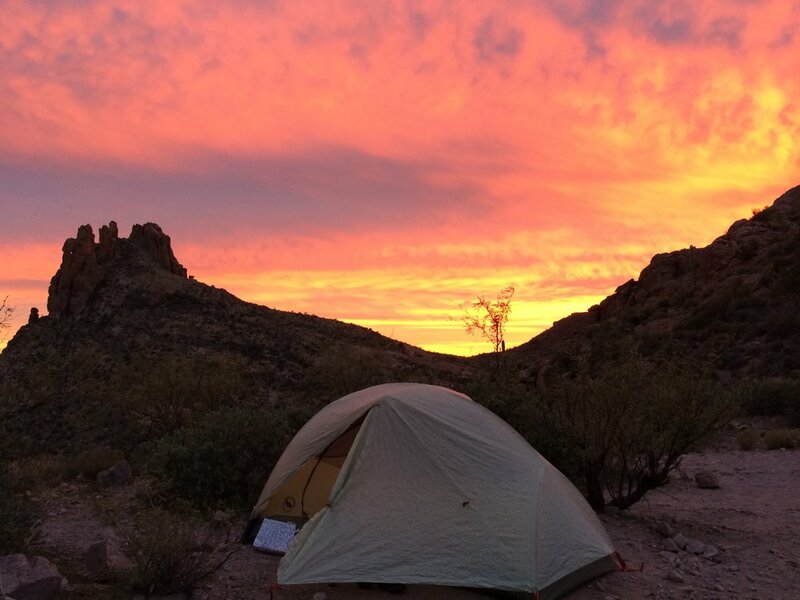 For several years now, my husband and I travel to Arizona in January to backpack in the Superstition Wilderness. I feel my Being Mind very acutely when I’m there, in the place of canyons, saguaros, and beautiful sunsets reflected off red cliffs. However, the imbalance between Doing and Being states of Mind becomes very prominent while I travel from New Jersey to Arizona. Doing Mind wins. I start worrying on my way to the train station to catch NJ transit train to the airport (“Have I left home early enough?”). I worry about checking in the luggage (“Will the backpack straps get caught in the luggage handling belts and rip the backpack?”). Plane ride is usually ok - I’m thankful not to be afraid of flying :). However, landing in Phoenix kicks off a new round of worries. Will the rental car work out ok? Will I get lost on the way to REI to get the fuel canister? Where will we eat lunch? How are the conditions on the trail? How’s the trailhead parking? Will we find enough water once in the desert? Is there enough light to reach our first planned campsite? The endless worry thoughts push me towards a frenzy of activity and I end up rushing. I become tense and snappish - exactly the opposite of what I am crossing the county for. A couple years ago I decided to try something different. I decided to take my time - stopping and noticing where I am at any given moment, letting go of the unrelenting urge to get to the next point. Lucky for me, my husband was all for it. I reminded myself that I always leave home on time and therefore I should just walk to the station at a normal pace. As we exited the plane in Phoenix, I mindfully filled the water bottles at a water fountain. Standing in line to get a sandwich at the airport, I pushed away annoyance, focusing instead on observing people. Once we got to the REI parking lot, we deliberately ate the sandwiches. We didn’t run to the store. You get the idea. For me, the key was to remember that I had made all the plans already, and I didn’t have to rush.This practice, slowing down during the transition moments, helped me maintain calmness. I still remember a sense of peace eating that sandwich in the parking lot. I actually enjoyed getting to the trailhead. I often think of that experience during my more disquieting days. The act of stopping, breathing for couple moments to notice the transitions has been helping me to avoid being stuck in Doing mind, and adds a little bit of space to my life. I’m more in touch with my Wise Mind.